Before the days of advanced computers and robotics, these handcrafted wooden contraptions adorned carnivals and boardwalks across the country. 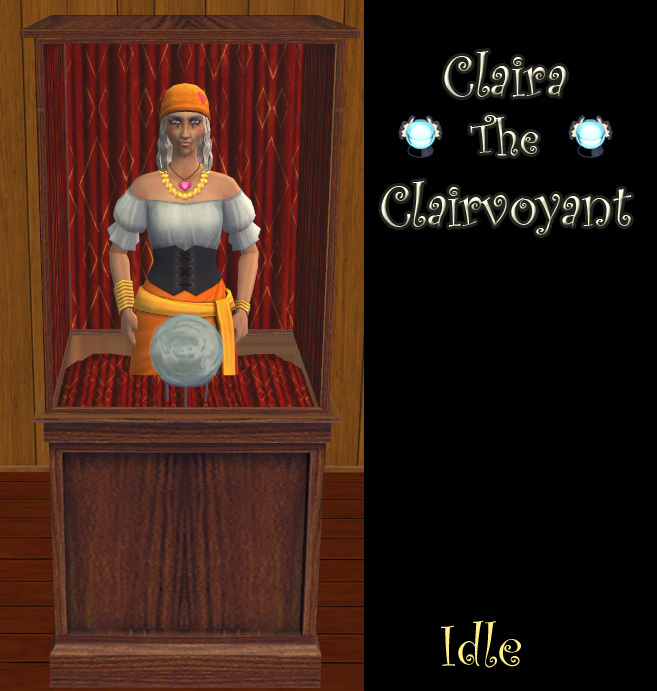 Few carnival barkers could sufficiently boast about the mysterious power and magic of one model in particular: "Claira the Clairvoyant." Surrounded by legend, its true origins are unknown. Some say she's cursed and that the technician who replaced some of her original components with electronic circuitry vanished without a trace. Claira is a fairly robust machine and will not need much maintenance. Curse or not though, anyone attempting to handle the booth's components should avoid using magnetized tools as this could disrupt various internal systems. You wouldn't want Claira to be mad at you, right? Found in Electronics > Misc for $1300. 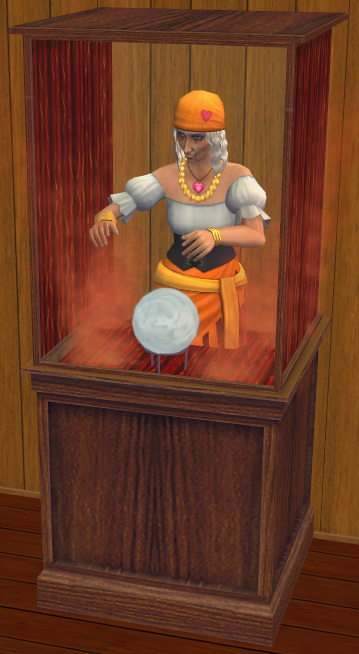 For $5, your Sim can have its fortune told. It's very possible your fortune will come true....but during what day and at what hour? Sorry, but the Fates barely like that you know anything about your future at all, let alone an exact time. The fortunes are randomized and telling you their outcomes would ruin the surprise. I will say, though, there are 12 possible fortunes. 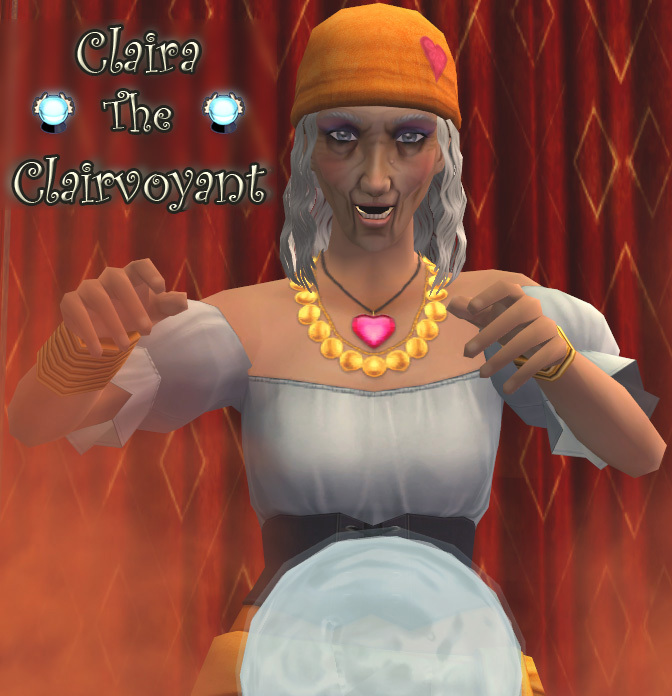 Please be advised that Claira may frighten some Sims though. Most certainly please heed that warning about using magnetized tools around her booth. Who knows what might happen? This mod should only require University, Nightlife, and Seasons. Please let me know if I'm mistaken or if there are any bugs. I've tested this the best I can. The NPC and crystal ball will appear in Live Mode. The curtain and the booth can be recolored. You may notice that when placed against a wall, the back curtain disappears. 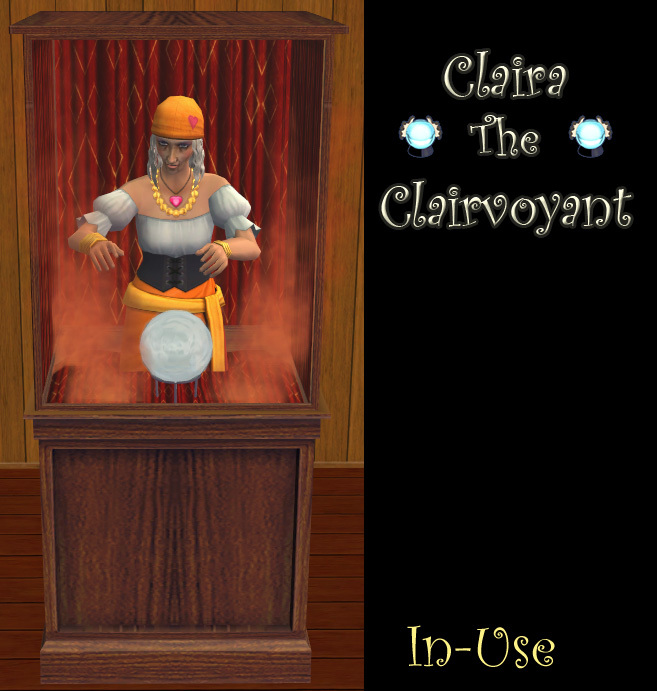 This allows you to place something behind Claira (like a mirror). -Echo: For all her help, her feedback, and her tutorials. -Smonaff: For the making the Period Hack which became the base for my controller. -Any of the Ranchies and #Create members who helped me. -Any other MTSer I failed to mention above.